I seldom ponder and feel that the life of metro has taken away the old traditions from the life of my kids and me and this makes me sad that how do I introduce the traditions to them. The vibrant colors, rich culture, amazing heritage, finger licking food and everything that just draws you there. The smile that natives have in spite of the hardships that desert life has for them and the hospitality that they have for their guests. “ Aao padharo mahare desh” the city that has this motto, calls every bit of you to join in the celebration of life that lasts not for a day or two but for the lifetime. The culture that has songs and hymns for every occasion for eating, sleeping, greeting, meeting what else can you ask for to get away from the chaos of the so called life of metro. 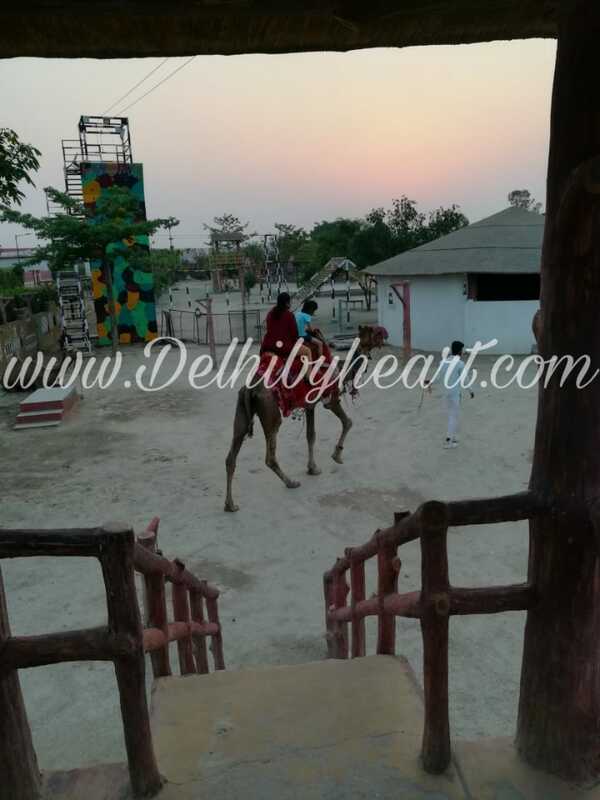 It just takes 2 hour drive from Delhi to reach Sonipat, Choki dhani, the “aao padharo mahare desh” family resort. The Sonipat choki dhani enlivens the beautiful Rajasthani legacy that will surely leave mesmerized with all the attractions and attributes of ethnic culture and convention. I wanted to treat my wife on her birthday and thus this special vivid outing for her and the kids. The rides just lit up the face of my kids as they were amazed to see these rides for the first time and their life, let the fact alone they were about to ride in them. The welcome drink was jalzeera that was truly refreshing and healthy and way better than the carbonated drinks. My kids loved it and also pledged to include it in their diet and do away with the carbonated drink. I am unaware how long will they stick to their plan but feel truly happy that they have an alternative and that to better one that will help them fight the scorching heat of Delhi. The smell of hot freshly fried bhajiyas or as all call it fitters drew ore attention and were munching on them. Eat bite was to be cherished and with so many activities we developed an appetite for them and the other awesome food that were to be laid in front of us. I tried my hands at shooting, bow and arrow, matki phod whereas the kids graced themselves by playing, break the glass pyramid. Basketball, long jump, latoo. The smiles, stories and giggles that these games brought in my life and their faces is something to die for. Truly exhausted but enjoying every moment we moved to see the traditional recreational arts and nt to forget also giving a shot at trying them. Dummy horse rider dance or the folk dances at traditional soulful music compelled us to tap our feat. Fire magic left us smitten whereas watching the magic show was a trip down the memory lane. No one is ever old enough to enjoy the bhool bhulaiya and as we treated on the maze the kids were hyper elated James Bond’s reincarnation. 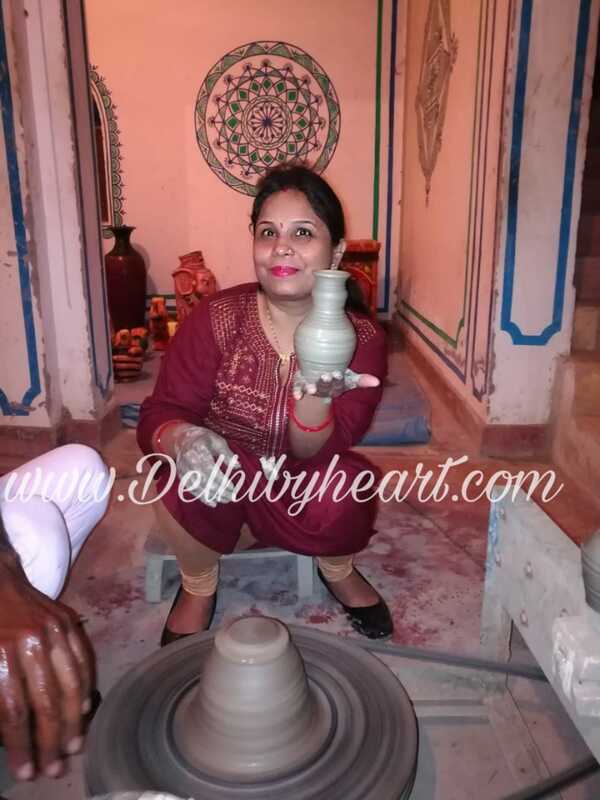 The live pottery helped us to admire the serenity of the pots and also giving it a try on the wheel was truly welcoming. As it was her birthday she adorned her hands with mehandi and lakh ki bangles that added to her beauty. The most important aspect of the day was awaiting us when we headed to calm our tummy, and must tell you the smell of the authentic food helped us to reach there, no directions were needed. Crosslegged sitting on the floor we were about to taste the mouth watering Rajasthani food. The kids were a bit startled to sit on the floor but were happy to try something new. The staff were so cordial and warm they helped us to get seated and served food with utmost fondness and love. A true insight in the hospitality of the Rajasthani culture. 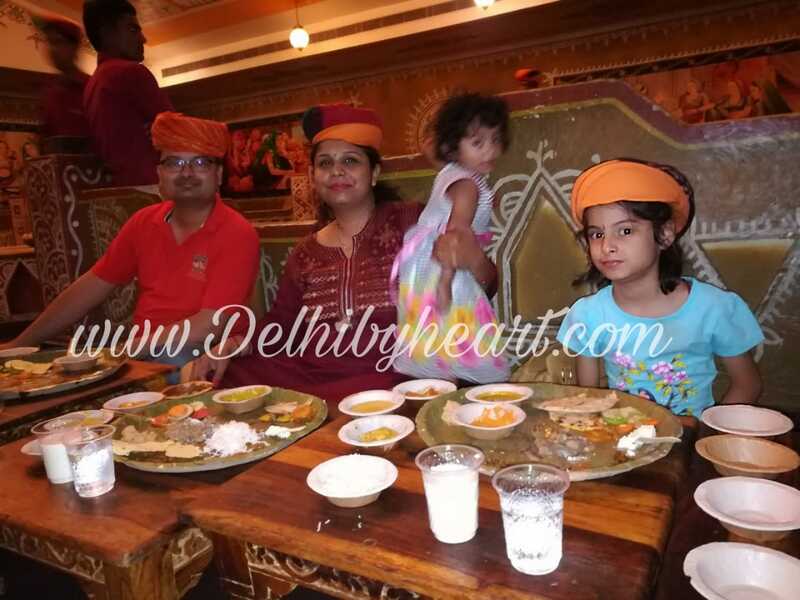 It was a Maharaja meal that they were serving us, bajra ki khichdi, imlana, jaggery, bajra ki roti and jau ki roti cooked in coal, it was a delight to see it being cooked and served steaming hot in our plates. Not to forget the authentic dal, batti, churma that was dipped in clarified butter was simply out of the world. Gatte ki sabzi and masala chaach was cherished, but more than the food the warmth with which they served and asked for extra serve was heat touching. No words can ever explain, or the clicks can actually show as how happy and contented we were on that day. All I can say it was day well spent with traditional insight in our lives. Eagerly waiting for my next trip. Wow! I haven’t been to Chokhi Dhani since I was a child but from your description, it seems the place has become even better than it was before. What a wonderful way to celebrate a loved one’s birthday. I have been to choki.dhani before and just loved it. Yummy food and great ambiance. Perfect for family outing. I have just one word, wow! City lives may seem promising but they drain out our souls! This place looks perfect for a family holiday! The ambience, the activities, the food! Everything is perfect! We have been to Chokhi Dhani in Pune a long time back, and truly it was a lovely experience. The food, hospitality, and festivity look amazing at this place. Choki dhani used to be a fun place to head to when I was in Delhi. I am not so kicked with the one in Mumbai. Being from a Rajasthani back ground and culture, I have an attachment with the concept, I visited many chauki dhani in different places and pleased to here that even Delhi has it. Next time whenever I am in Delhi I am surely visiting this place. There is a similar place in Indore and your post reminded me of that. Very beautiful place with awesome Rajasthani culture. 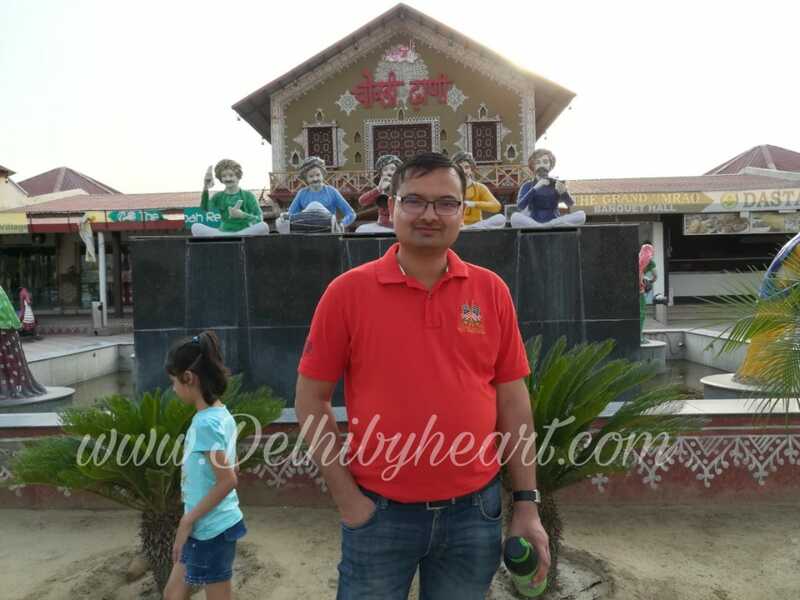 Choki Dhani introduces one to the beautiful Rajasthani culture and awesome food. I loved visiting it too. It was a great experience. Good to see Chokhi dhaani here. I’m a Rajasthani, who have stayed in Jaipur and jodhpur for years and the culture, food of Chokhi Dhaani makes me feel proud of my place. It’s quite a fun place for kids and families. I visit this fun place every time I visit Jaipur. It’s such a vibrant place to be. It’s most enjoyable when you have a big group. You have covered the place beautifully. I just love Rajasthani food. And their culture as well. This is surely a place to hang out with family.